Korea, China and Japan have agreed to restart their three-way high-level dialogue in nearly one year in efforts to mend relations eroded by territorial and historical brawls, Seoul’s Foreign Ministry said Friday. The one-day event is slated for Sept. 11 in Seoul, bringing together Lee Kyung-soo, Seoul’s deputy minister for political affairs; Liu Zhenmin, Beijing’s vice foreign minister; and Shinsuke Sugiyama, Tokyo’s deputy minister. It will be the first deputy minister-level gathering since last November and the ninth since its 2007 launch. The high-level meeting is a major dialogue channel along with the trilateral summit and foreign minister- and deputy director general-level consultations. “At the ninth edition, the three countries plan to review the current state of trilateral affairs and joint projects, and exchange views on future cooperation and other issues of interest,” Seoul’s Foreign Ministry said in a statement. Seoul has managed to get the other two partners onboard despite its severely strained relations with Tokyo and Japan’s reluctance to join the gathering without a clear vision for a tripartite summit. New programs to be introduced next year are designed to crank up collaboration on areas including maritime affairs and cybersecurity, a ministry official said. “We’ve proposed resuming the consultations, seeking to maintain the momentum of cooperation between the three countries and expedite discussions on issues at hand as well as next year’s projects,” the official told reporters on customary condition of anonymity. The focal point is whether the meeting will lay the groundwork for the sides to find middle ground and bring their bi- and trilateral partnerships back on track. The three countries will likely hold bilateral consultations on the sidelines of the talks. 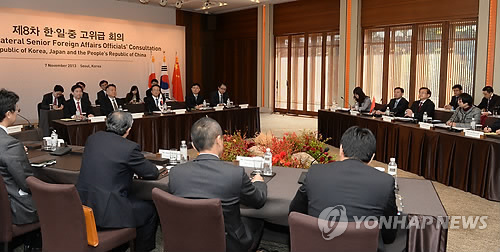 Last year, Korean officials met with their Chinese and Japanese counterparts separately but the latter two did not meet. Chances appear slim for a breakthrough given stark differences in their positions toward wartime history. Officials and expects forecast that the Abe government will continue to accelerate its pursuit of a “normal state” with a full-fledged military and assertive foreign policy agenda, without reflecting on its imperial past. Yet speculation has been growing over a possible gathering between Chinese President Xi Jinping and Japanese Prime Minister Shinzo Abe on the margins of the Asia-Pacific Economic Cooperation conference in Beijing in November, which has apparently propelled Seoul to recalibrate its strategy and explore the possibility of a trilateral summit including President Park Geun-hye. “We need to differentiate between bilateral and trilateral meetings. We worked hard for the inception of the three-way initiative back then, thinking it would contribute to peace and prosperity in Northeast Asia and thus benefit us,” the official said. His remarks signaled a slight turnaround in the government’s position toward the tripartite meeting. When last year’s hard-won deputy minister-level dialogue yielded no major outcome, Abe’s desire to visit the Yasukuni Shrine the following month was perceived as the decisive obstacle, but Seoul’s lackluster stance toward any summit-level exchanges seemed to have served as a contributing factor. Stakes are high for the Park Geun-hye administration, which is coming under soaring pressure in the face of a stubborn gridlock in the country’s bilateral ties with North Korea and Japan. Mindful of the gravity of the situation, Seoul is pushing to resolve the issue of so-called comfort women as early as possible and in a way that is acceptable to the victims and their families through ongoing monthly talks with Tokyo. A fresh round of negotiations are expected to come after next week’s Chuseok holidays. “The two countries are currently coordinating their schedules. … We’re calling for Japan to come up with a concrete resolution to be discussed in the fourth round of talks, which would naturally take it a while (to come up with),” the official added.